Pets are survivors of domestic violence too. When domestic violence occurs, pets are often threatened or harmed by the violent partner. By providing shelter and care for pets, ASN helps survivors leave an abusive home and go to a domestic violence shelter without the fear that their animals may be left behind in a dangerous environment. Animal Safety Net (ASN)™ assists many domestic violence survivors by offering temporary housing for their pets, taking them out of harm’s way, and allowing domestic violence survivors to relocate to a shelter. The goal of Animal Safety Net™ is to reunite people with their pets once they are safely out of the domestic violence shelter. Offer Animal Safety Net (ASN)™ at your shelter! 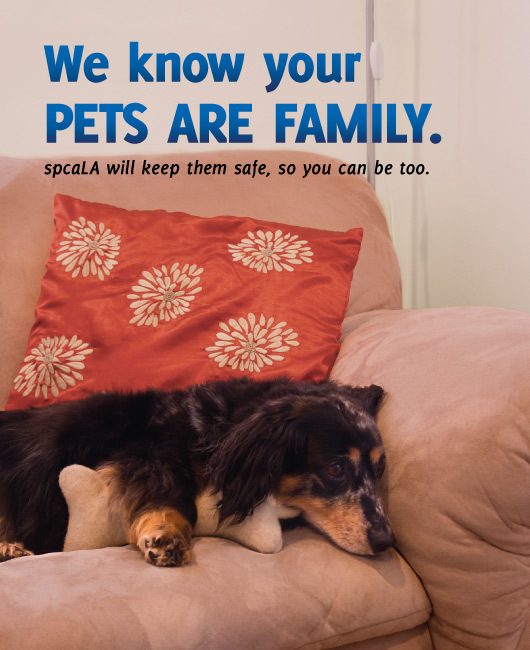 spcaLA offers the ASN™ manual as a free resource for animal shelters and other organizations who wish to offer the program in their communities.